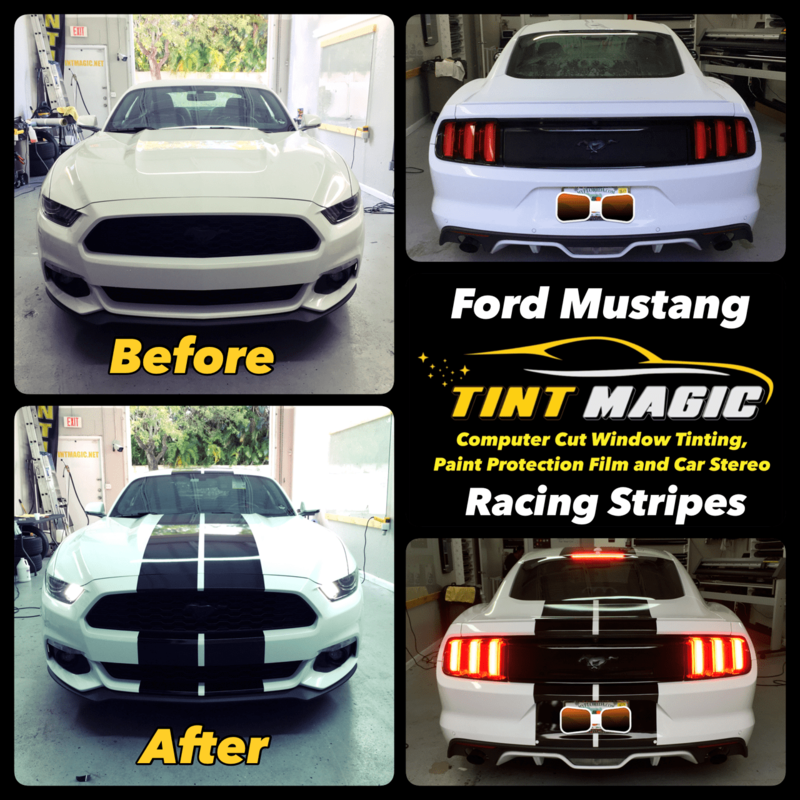 Ford Mustang Racing Stripes at Tint Magic Window Tint. Call us for a free estimate! (954)840-7883. The galloping pony nestled in the grille serves as a reminder that the Mustang is most at home on the open road. Both the coupe and convertible come with your choice of a 300-hp 3.7-liter V-6, a 310-hp 2.3-liter turbo four-cylinder, or a 435-hp 5.0-liter V-8; choose from a six-speed manual or a six-speed automatic. The rear-wheel-drive chassis is eager to attack corners while enabling a smooth ride when cruising. The manual’s stiff clutch makes it a bit of a chore to drive in heavy traffic. For the Mustang’s 50th year in service, Ford went back to the drawing board, we think with the distinct goal of eliminating the stigma of the non-V8 Mustang. While the V6 is still being offered (your local Avis and Enterprise lots wouldn’t be the same without them), it’s best to think of the new, four-cylinder, turbocharged Mustang EcoBoost as the entry-level model. Like the V6 before it, certain boxes are correctly ticked. Dual exhausts? Check. 18-inch alloys? Check. (Our EcoBoost Premium model even shares its wheels with the base GT). HID headlamps? Check. Up front, there’s a surprisingly meaty chin spoiler while the muscular lines of the ‘Stang’s long hood tie in nicely with the fastback shape, which terminates in a neat rear spoiler. There’s even a body-colored diffuser at the back, between the chromed exhaust tips. The bottom line is, unless you’re a true Mustang aficionado, you’ll be hard pressed to tell the difference between the turbocharged car and its 435-horsepower brother. Simply sitting in the redesigned cabin isn’t enough to give the EcoBoost away, either. The leather-trimmed seats (standard on the Premium trim) are cozy and supportive, with plenty of bolstering to help keep both driver and passenger in place while the ‘Stang exhibits its newly enhanced cornering abilities. For the first time in recent memory, dropping $1,595 for the optional Recaro seats is no longer a no-brainer, as we found these seats quite pleasing as the miles and Gs piled on.